Today, we took the Cookbook of the Day, post! It's only fair as they are always stealing our Famous Food Friday posts. Down the road about two miles from Stonehenge is the Lake House, not so much a “house” as a castle. In 1991, Sting and his wife, Trudie Styler bought the Lake House and spent 5 years restoring the house and grounds. Now they have a lovely house (castle) with lovely gardens. Of course they have gardeners and greenhouses and a kitchen staff and well, she is married to Sting, he makes $2000 dollars a day from the royalties to Every Breath You Take, alone. Think of what he makes with Roxanne thrown in. So now Trudie has a castle, a garden, and a cook so the natural progression is to write a cookbook. Aside from the fact that I don’t have a gardener or two or seven and that I stand in the kitchen alone, I really like this cookbook. 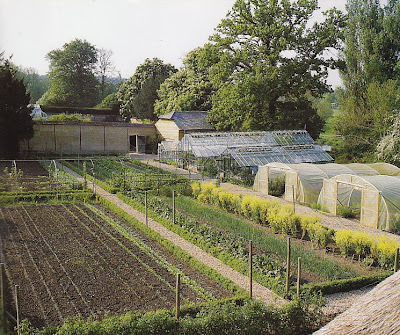 And I really aspire to Trudie's kitchen garden! 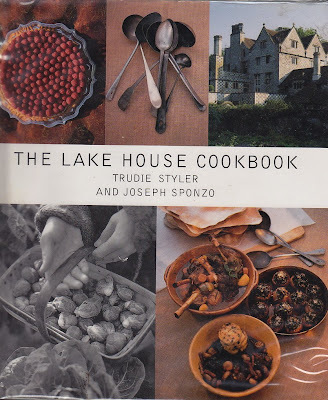 The cook, Joseph Sponzo, is credited as the co-author, though Styler gets top billing. The food is good and reasonably easy for those of us sans staff. Heat the oven to 400 F or prepare a charcoal grill that is medium hot. Cut 12 pieces of kitchen foil measuring 8 inches square. Transfer the onion parcels to a baking sheet and cook in the oven for 25 to 30 minutes or until tender. Alternately, place the parcels on the grill of a medium-hot fire and cook until the onions are tender. For more on the Lake House check out his Architectural Digest spread from 2007. I knew I should have married Sting when I had the chance! 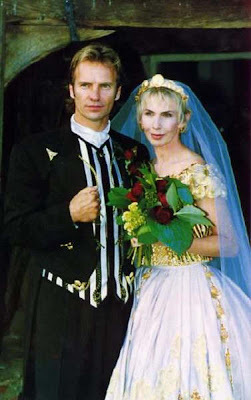 Instead, this month, Sting and Trudie will celebrate their 17th wedding anniversary. The "traditional" gift for the 17th anniversary is furniture. Frankly, I am at a loss as to what to get them.